One of the really cool things happening in today's beer scene is the trend toward pairing beers with food. This is the sort of thing that was once confined to the wine community. But craft beer is the new wine, with tours, events and food pairings galore. I regularly see social media posts for brewers dinners where beers are paired with multi-course meals. Laurelwood has one coming up soon and it will feature beers from several breweries. That's a terrific idea. Instead of being exposed to the wares of a single brewery, several breweries are on display. 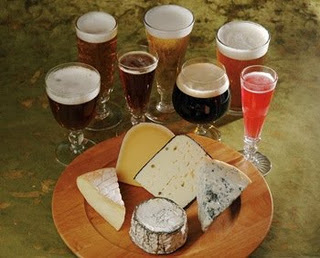 Beer and cheese...a great combination. In some respects, pairings aren't new. Fred Eckhardt, the dean of American beer writers and a local icon, has been doing beer and cheese tastings for 20 years. I believe he also has events that pair beers with chocolate, although that might just be something he does in the background so he can write-off chocolate purchases. These are great ideas. They effectively encourage beer fans to think about what kinds of beer to serve with different dishes at home. Instead of blindly serving up a hoppy IPA with everything. we're learning that other styles may be more appropriate. That's terrific. Thinking about the power of pairings, I conjured up images of macro-pairings I'd like to see. 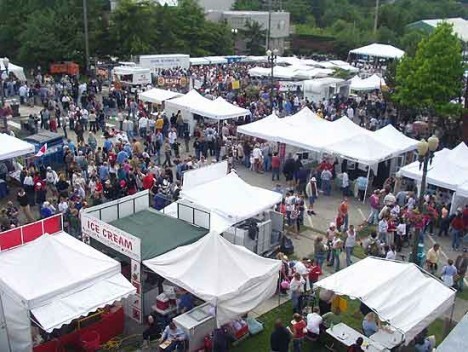 When we think about promoting craft beer, we often think about beer-driven events. I'm talking about events large and small, from the Oregon Brewers Festival to an Oktoberfest event held in pub parking lot of a nearby pub. What about more complete pairings of craft beer with non-beer events? Look at the tailgating that goes on at large sporting events. People eat and drink outside stadiums at least partially because they don't want to pay exorbitant prices for low quality stuff inside. I recently heard about a brewery that was doing a tasting before a college game. I believe it was in Seattle prior to the Oregon/Washington game. I don't know about the licensing and liquor control issues related to doing something like this, but it seems like a great way to expose the masses to craft beer. Here's the thing: Anheuser-Busch and MillerCoors spend millions every year to maintain their connection to big-time sports in this country. Their advertising is in your face when you enter any stadium. The beer choices inside these venues are, in most cases, controlled by the big guys. Care for a Bud Light? Outrageous. How do you fight this? In my mind, craft breweries need to pair themselves with high profile sporting events. The way to do this in the short run is by having beer gardens where fans can experience quality beers prior to the games. I know a lot of places, including Moshofsky Center next to Autzen, already serve some craft beer alongside crappy macro-stuff. That's not enough. This kind of thing is certainly happening on a small scale now. It would be great if it grew. That's not to say it would be easy. I can only imagine the red tape connected to setting up events like this. But the potential upside is huge.